Pick 5! Yours free with purchase. Best lip shades for warmer weather. FREE 11pc gift with purchase. * Offer begins at 12:00am EST on July 15, 2018 and ends at 11:59Pm ET on July 21, 2018 or while supplies last. 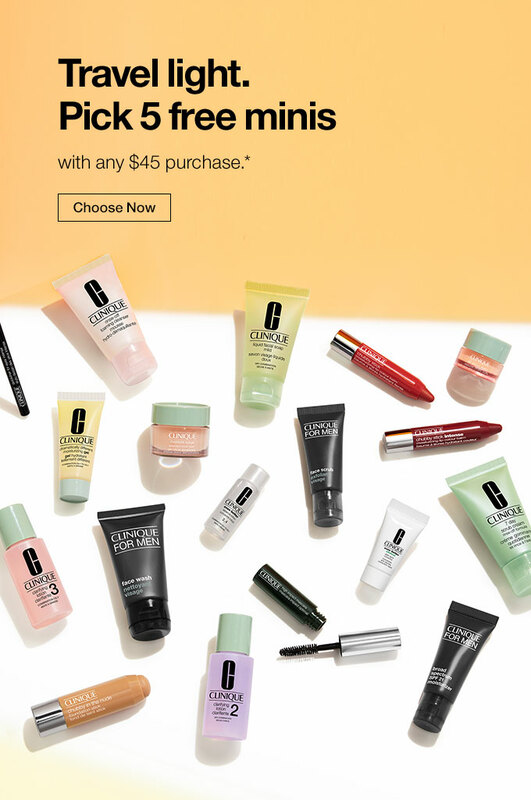 Spend $45 and pick 5 free minis at checkout. No code necessary. Sample selection may vary at checkout. Offer available to U.S. residents only. Smart Rewards members receive free standard shipping with any purchase. Non-Smart Rewards members receive free standard shipping with a purchase of $50 or more. Offer available to U.S. residents only. Quantities are limited and offer is subject to availability, while supplies last. Only one per person. Only one offer code per order. Offer is subject to change or cancellation without notice. We reserve the right to substitute any free item offered with an item of equal or greater value. Offer may not be used in combination with any other offer or discount. Applicable purchase amount does not include the purchase of gift sets, eGift cards; sales tax; shipping and handling; items noted as not eligible; items that are not in stock at the time of purchase; pending purchases or purchases made prior to the start of the offer or after the offer ends. All purchases are subject to bank authorization prior to processing. Only authorized purchases will be processed and shipped. Other restrictions may apply..
Foundation that’s just your shade plus FREE 11pc gift with purchase. Be the first! 7-pc. gift + more FREE with purchase. A $211 value. Starts now! Build your free gift with purchase. Up to a $211 value. Flirty or Natural? Pick your free kit with purchase. -mark your calendar! Free gift for spring. Give Mom an exclusive skin care set. Plus, free kit with purchase.